A few days ago, I was hit with a sudden craving for Kaya. In fact, I was hit hard. Over the wonder of twitter sphere, Instagram pictures of this immensely popular Singapore breakfast jam appeared relentlessly from fellow Singaporean bloggers who went back on holiday. Now, ogling at all those layers of dark, rich jade green jam spread liberally across well charred toast is too much for me to handle. 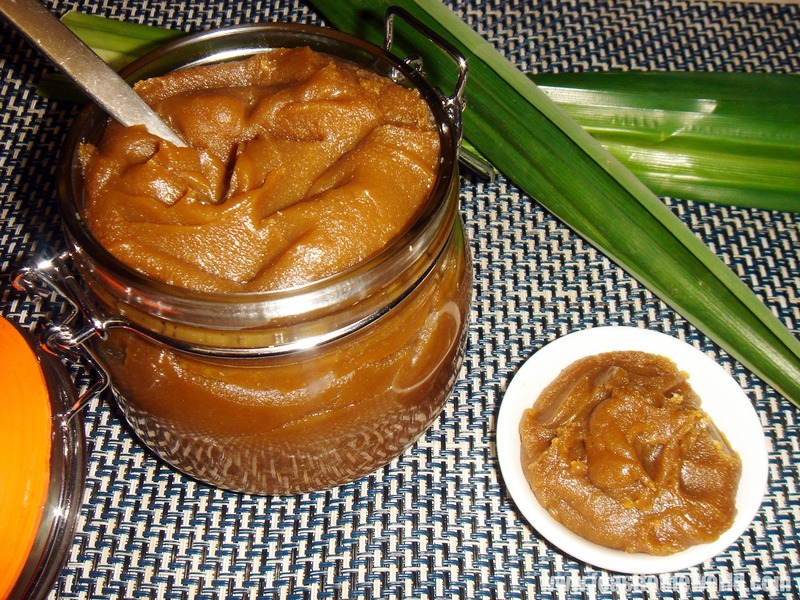 So I made it my mission to made some Kaya jam to indulge in my craving pangs. Despite being described as jam, Kaya has little in common with the usual fruit purée condiment that many are familiar with. Made with eggs, sugar, coconut milk and flavoured with the Pandan (screwpine) leaves, it is more like a type of custard. Along with the soft-boiled eggs and strong white coffee (kopi), the kaya-toast formed one of the most popular breakfast menu in Singapore. Famous coffee-shop or kopitiam (as it is known in Singapore) like the one in Killiney road would have diners travelled far and beyond to spent a lazy Sunday in this tiny establishment just to savour their signature Kaya-toast. This revealed our nation's obsession with this delectable condiment. There is a ceremony to perform in order to get the perfect Kaya toast. The slices of bread will first have to be toasted over charcoal, this gave a smoky aroma and a lovely crispy crunch; a thin layer of margarine is then strategically spread over the toast, covering every exposed surfaces. Finally, the majestic Kaya will be liberally donned over the glistering yellow base....and a mouthful of yumminess is born. 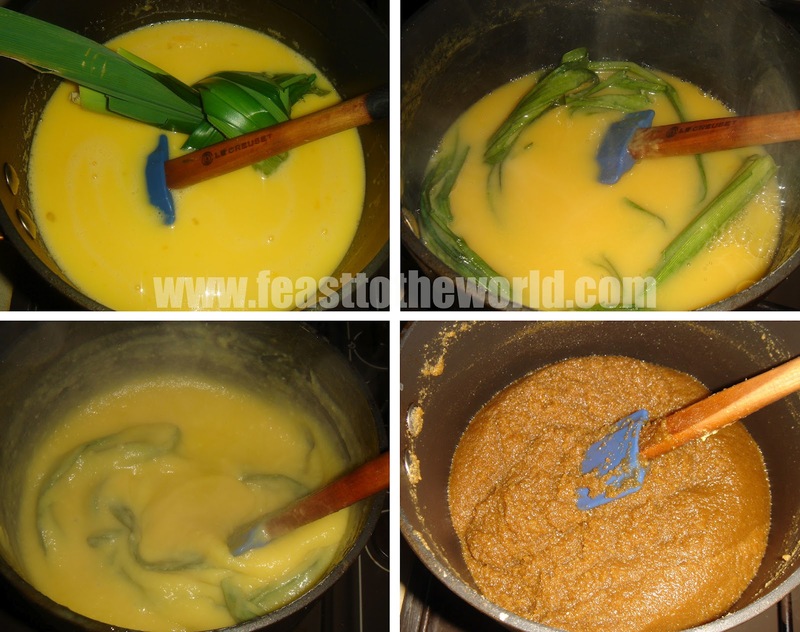 Kaya is not that hard to make, although it is quite laborious and does requires a lot of stirring. So if like me, you want to make your own, which I can ensure you that will taste so much more superior than any shop bought version, make sure you set yourself aside some spare time and be prepare to be confined to the stove for a good few hours with a good book to hand (or a devoting assistant). 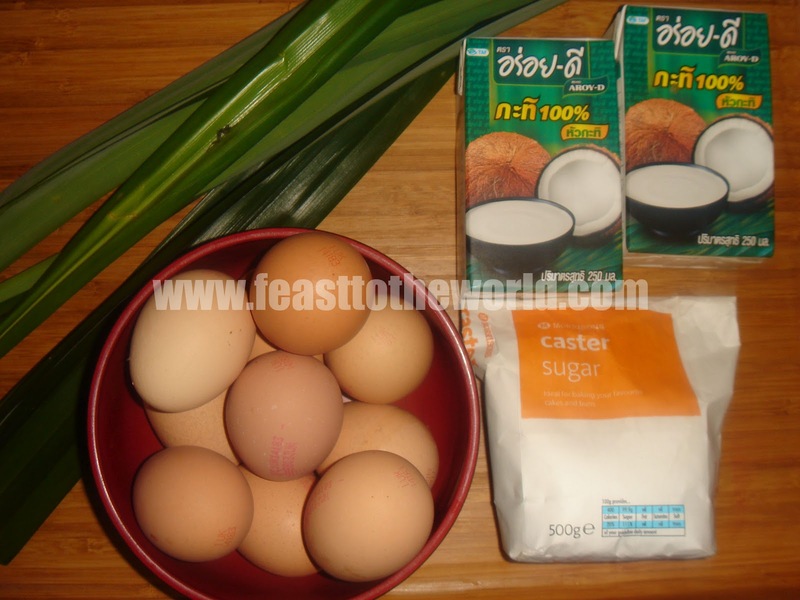 In a large bowl, lightly beat the eggs and sugars together with a whisk. Add the coconut milk and mix well. Put the egg mixture into a pan together with the pandan (screwpine leaves) and heat over a very low heat, stirring vigarously for 20-25 minutes, until the sugar has fully dissolved and the mixture has thicken. Cook the mixture for another 11/2 to 2 hours over a very low heat, stirring constantly to prevent it from curdling. Alternatively, you can cook the jam bain-marie style. Fill a larger pan with simmering water and cook the pot of egg mixture in the simmering water with the lid on. You will still need to stir it every other 10 minutes. This prevent direct contact with the heat but will lengthen the cooking time to 3 - 4hours. During this time, the sugar will slowly caramelise and the Kaya is ready when you have a thick, dark golden brown jam. This can be now store away in a sterilised jar for up to two weeks in the fridge. For a smoother consistency, blitz the jam in a food processor before storing.